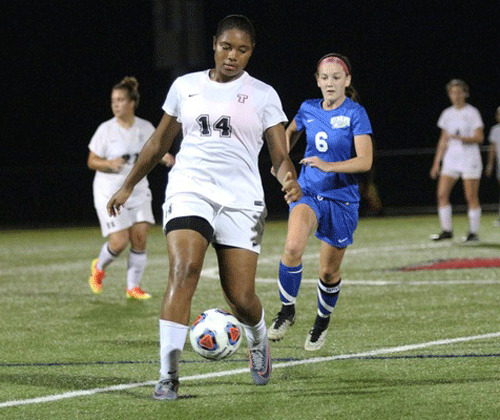 Jada Samuels and Taznae Fubler’s teammates Katherine Hoving and Samantha Griffin each scored hat-tricks to lead the Thomas College Women's Soccer team to a 8-0 victory over Pine Manor on Smith Field. Nikki Bradstreet put Thomas on the board in the sixth minute on a goal assisted by Hoving. Hoving and Griffin each scored their first of the game in a two-minute span in the 26th and 27th minutes. Griffin added another, assisted by Amelia Kelby, two minutes later to make it 4-0. Hoving put up her second goal in the 33rd minute to put Thomas up 5-0 at the half. Griffin complete her hat-trick in the 63rd minute on a dish from Hoving. Cassie Contigiani picked up her first of the season, assisted by Griffin, in the 69th minute, before Hoving ended the scoring with her third goal in the 74th minute. Kayla Gordon picked up her second shutout of the season for Thomas, while Kristina Guinta was given the loss for Pine Manor.